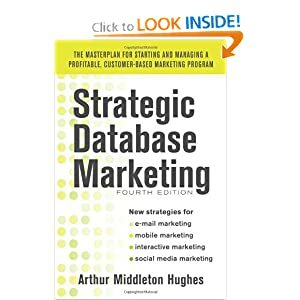 For a retailer to succeed in database marketing, you need a database with transaction history. The difficulty is in capturing the data. Some people pay by check or cash. Others use a VISA or MasterCard. All large department stores issue cards they hope their customers will use. In fact, only the most determined customers use the cards. It is a nuisance to carry around ten or twelve store cards in addition to your Master, Visa, or Amex cards. The solution to this situation is to get customers to register their bank credit cards with you, so that when the customers use them, you will know that they have made a purchase. Idine has made a successful business out of this idea. Members register their credit cards with iDine. Then whenever they go to any of the 7,500 restaurants anywhere in the country and pay for their purchases using one of these cards, iDine finds out about it and gives them a credit on their credit card account or gives them airline miles. The customers donÍt have to say to the restaurant, ñBe sure to let iDine know that I am eating here!î The process is so simple that it is amazing that more retailers have not caught on to this idea. In the absence of a registered credit card to identify their customers – and because it is often more effective — many retailers are using a reverse telephone match to capture customer data. The Sports Authority, the largest full-line sporting goods equipment retailer in the US, is a good example. Retail sales are often driven by the calendar. People are in the buying mood before Christmas. The mood is entirely different a month later. The Sports Authority, which operates 198 full-line sporting goods superstores in 32 states across the US, wanted to respond to existing and new customers in key markets around the busy holiday shopping season. Like most retailers, it gathers information about customers at the point of sale. However, by the time any information on a customer made its way to The Sports Authority marketing department for use in follow-up or promotions, at least a month had elapsed. To capture repeat business before the four-week holiday season ended, Jeff Handler, SVP, Advertising & Marketing, looked for a way to shorten this time to a one-week window using direct mail. The vision was to identify the customers, and then, using print-on-demand, react to those customers with an appropriate direct mail offer, all within one week after any store visit. Few retailers in America have ever accomplished such a feat. The Sports Authority customer contact strategy involved point-of-sale data analysis, interaction with the full customer database, and creation of customized marketing communications. The Sports Authority centers its holiday promotions around the first week in December. For this program, The Sports Authority focused on its in-store customers, as opposed to Web or catalog customers. The most difficult elements of the project included getting a program in place by November 30 from the starting point of early November, and then being able to quickly turn around a second offer to customers and prospects. Part of the process involved matching the in-store customers to their mailing addresses. The team used a reverse telephone number append process. Each clerk at each point of sale station captured the buyerÍs telephone number as a part of the transaction. Every night, this data was transmitted from each of The Sports Authority stores to the central database where the phone number was matched to mailing addresses using reverse append. With its database process and the help of an outside database vendor, The Sports Authority was able to do that within one day of the purchase. Many of the names and addresses were on The Sports Authority customer database. Other names and addresses came from rented telephone append lists. The next day after any purchase, The Sports Authority was able to identify the name and address of almost every person who provided a phone number the day before. They were then able to print and mail them a targeted direct mail certificate that would arrive in the shopperÍs mailbox within one week of her visit to the store. The project started in November with a holiday gift guide mailed to all existing retail customers near each store. In certain key markets, there was some targeted prospecting as well. If the person made a purchase based on the gift guide they would receive a second standard post-card offer within one week. The Sports Authority says approximately five percent of the shoppers who received the initial gift guide came to the stores and used the certificates. The follow on mailing to anyone who responded to the first holiday mailer brought in double-digit response rates, essentially tripling the industry norm for response rates, and, most importantly, bringing back those customers to shop again before Christmas. Why did it work? Because of recency and a solid offer. The customer most likely to respond to any promotion is the customer who made a purchase the most recently. The increased sales were so significant in comparison with the cost of the program that The Sports Authority has made it a permanent part of its marketing program.